Streamsides and moist places below 7000’. All over Washington below 7000’. Clematis ligusticifolia is closely related to Clematis drummondii, with which it is thought to hybridize with when they are in areas of contact. Seed, Internodal cuttings of soft to semi-ripe wood, late spring in sandy soil in a frame. hardwood cuttings and layered. Leave seedheads to dry on plants then remove and collect seeds. Prick out the seedlings into individual pots when they are large enough to handle and grow them on in a cold frame for their first winter. Pre-soak the seed for 12 hours in warm water and remove as much of the tail and outer coat as possible. Seed - best sown as soon as it is ripe in a cold frame. Seeds are kept dry and stored in a refrigerator. Seed - best sown as soon as it is ripe in a cold frame. Sow stored seed as soon as it is obtained in a cold frame. Pre-soak the seed for 12 hours in warm water and remove as much of the tail and outer coat as possible. A period of cold stratification is beneficial. The seed germinates in 1 - 9 months or more at 20°c. Prick out the seedlings into individual pots when they are large enough to handle and grow them on in a cold frame for their first winter. Plant out in late spring or early summer, after the last expected frosts. 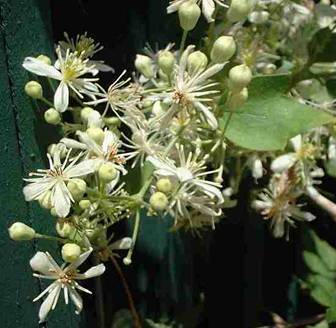 Best to plant container grown and in order to avoid the disease 'clematis wilt', it is best to plant the rootball about 8cm deeper in the soil. Unkown but far away from anything you don’t want it to grow all over. Moist soil, some shade and moderate watering through the summer. Varies. Will last anywhere from 3-10 years and can grow up to 20’ high.